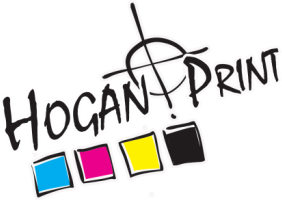 Since September 15th 2017 Hogan Print have taken over the job book of Impression Print, Wexford. We will continue to trade out of Impression's former print works Unit 5, Pinewood Business Park, Whitemill, Wexford. Hogan Print is a printing and graphic design business, based in Enniscorthy, County Wexford and is ideally located to cater for all your customer needs. We have over 30 years experience in the lithographic and digital printing trade and have built up an excellent reputation for fast, efficient low cost print and design. We are a family run business where we work very closely with our customers to ensure we meet their printing needs to the very highest quality. Offering outstanding customer service and print quality Hogan Print produce high quality affordable printing for all your printing needs including: Brouchers, Books, Tickets, Business Stationery, Wedding Stationery, Memorial Cards, Banners, Pop Up's, Signs, Outdoor Stickers, Van Signage, Web Design and Tshirt printing. If you have any print requirements then we would like to extend to you all our professional experience and advice and we will be happy to offer you a quotation with no obligation.